The magician challenges a few children to a “bubble gum pulling contest.” He hands each child a wrapped piece of gum and explains that whoever can stretch their gum the furthest wins. In turn, each child tries and can only get their gum to stretch a few feet, but when it’s the magician’s turn, he stretches his gum over 35 feet! These coils can also be used as normal Mouth Coils which enable you to produce a long ribbon of paper from your mouth, hand, or a production prop. 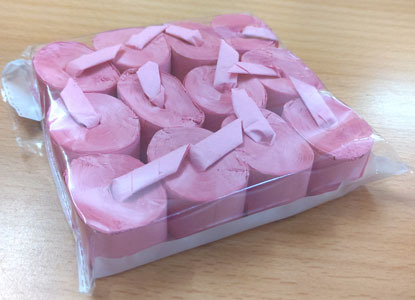 We supply you a dozen of the specially prepared Pink Coils, and each Coil can be used once, to produce one long (35 foot) paper ribbon.